SpectrumWorx v2, Other effects bundle or multi-effect from Little Endian. Little Endian has announced the release of SpectrumWorx version 2.0 for Windows in the form of a VST effect plug-in. Branded as "the ultimate sound mangler", SpectrumWorx is said to represent Little Endian's latest advances in the frequency domain effects processing. Version 2 has been rebuilt from the ground up since being acquired from DelayDots, the company says. Over fifty modules (pitch shifter, classic vocoder, wah-wah, robotizer, wobbler, autotune, reverser, etc.). Sophisticated engine optimized for low CPU usage. 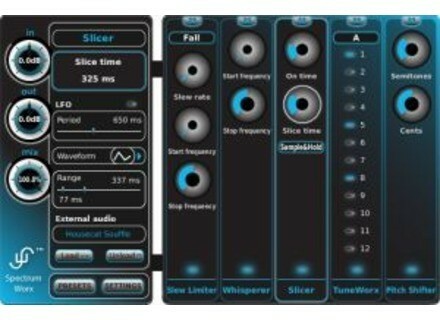 SpectrumWorx costs $119 and is available for Windows as a VST Effect plug-in. The new version is available for evaluation and purchase at Little Endian's web site, www.littleendian.com. Plektron Guitar Amp Plektron has announced the release of Guitar Amp, an amplifier simulator and multi-fx for guitar and bass, but not only. tOSC AU-300 tOSC has released AU-300, a Mac OS X Audio Unit Plug-in-based MIDI-Programmer for some famous Japanese synths from the Mid-'80s. 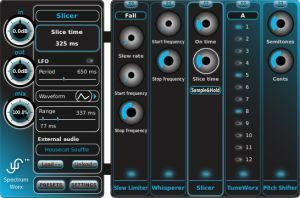 Homegrown Sounds Scala Creator Homegrown Sounds has released Scala Creator, a VST plug-in for Windows designed to make creating Microtonal patches in Scala format an easy process.